90s alternative rock was a turning point for me in music. It took me from a passive listener to an active music aficionado. I distinctly remember how it drew me in with its reverberating guitars, complemented by passionate vocals. One of the most renowned bands of the alt rock era was Oasis. A band of brothers and friends, whose instability fueled their success, but also catalyzed their demise. In Oasis: Supersonic, Liam and Noel Gallagher tell their story in their own words, recognizing their missteps, but unapologetically owning their experience. 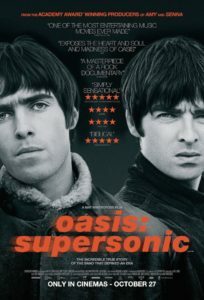 Much like Asif Kapadia’s previous documentary Amy, which chronicled the rise and fall of Amy Winehouse, Oasis: Supersonic takes steps to humanize its characters and shed light on the person versus the persona. Unsurprisingly, The Gallagher brothers grew up in emotionally and physically stressful circumstances, rising above their dealt hand to inspire a generation. What struck me as beautiful in this story is while sibling rivalry remains an unyielding force in the relationship between Liam and Noel Gallagher, both appreciate and recognize the talent of the other — Liam the singer, Noel the songwriter. Together with Paul “Bonehead” Arthur and several others, they acknowledge that while none of them are the greatest musicians in the world, their music transcended themselves, sparked by a devout fan base, it spread like wildfire across the globe, cementing them in history as one of the greatest bands of the 90s. Timeless for me are songs such as “Wonderwall,” “Champagne Supernova,” and “Don’t Look Back in Anger.” Streaming for free on Amazon Instant Video for Amazon Prime members, I recommend this walk down memory lane for those that lived the Oasis saga, as well as for those who want to understand one of the key influencers of modern day indie rock. This entry was posted in film, movies, music and tagged amazon instant video, amazon prime, oasis, oasis: supersonic.